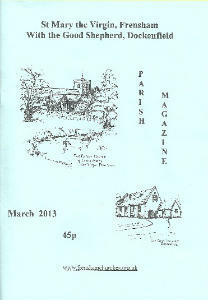 The Frensham & Dockenfield Parish Magazine is printed each month and distributed to around 500 homes. It contains details of Church services, news, up-to-date information on Village Societies and Clubs and articles by parishioners. It is funded by subscription and advertising with all proceeds contributing to the running costs of the Parish. Items for inclusion in the magazine should be sent to the editor by the 15th of the month; this is to ensure that it reaches the printer and collators in time for distribution. Philippa Hall and Penny Garrard are Co-Editors. The fee for an advertisement is £72 per year and each subsequent advert is £10 per year. There is no VAT. Advertisements should be booked and paid for by 1st November for inclusion in the following calendar year. The subscription fee is 60p per month or £7.20 per year (payable in January each year for magazines covering the 12 month period January to December). If you live outside of the Parish you may have the Parish Magazine mailed to your home; the cost for this is a 2nd class stamp per month.